One day last week I took a tour of the most famous cemetery of them all. I'd expected it to be amazing ... and it certainly didn't disappoint. 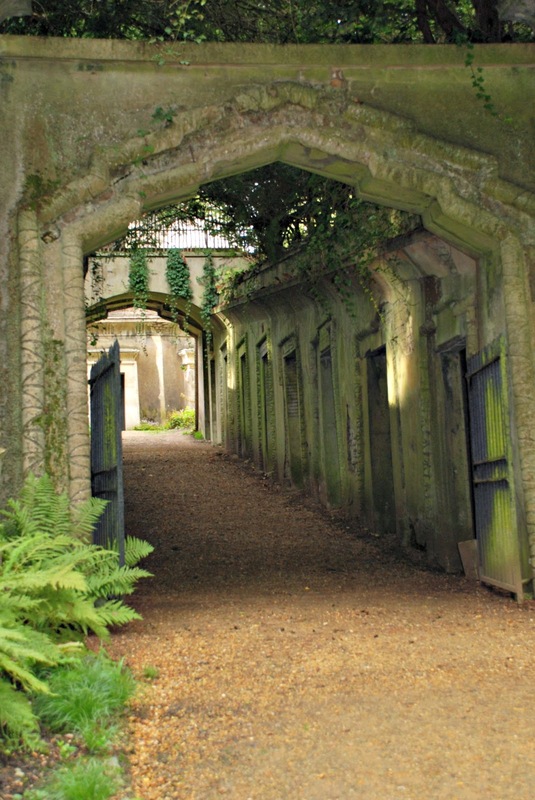 Highgate Cemetery is divided by Swain's Lane into the East Cemetery, where you are free to wander around on your own (after you've paid the £4 entry fee) and the older, West Cemetery, which you can only access on a guided tour. There were a number of other people there when I arrived, not many, but enough for the whole thing not to feel too uncomfortable. Call me a numpty, but I was glad to have the company of the living as I walked amongst the massed ranks of the dead. The sun was shining, and the leaves were gently tinged with autumn. A small funeral party were bidding their last farewells to an elderly relative whilst a silent multitude of stone angels watched from every corner as we all went about our business. 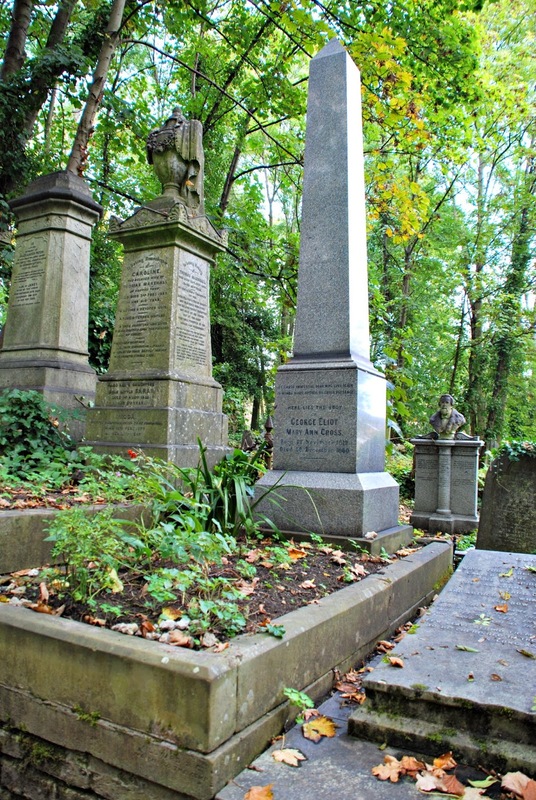 The West Cemetery was opened in 1839, and the East Cemetery was added in 1860. Most of the funeral architecture is high Victorian, and packed full of symbolism, with more than a little bit of middle-class snobbery on display too. In London they say that only three things matter when it comes to property: location, location and location. And that rule also seems to have applied to the Victorian dead. The objective was to bag yourself a plot on the edge of a main path, and then build something that was more eye-catching than anything the neighbours had put up. The plots further back were much less desirable given the greater likelihood that your mortal remains would languish unseen and forgotten in the shadows: eternal oblivion in obscurity was definitely not the way to go; gone but not forgotten was the credo. Death was an opportunity to show-off. 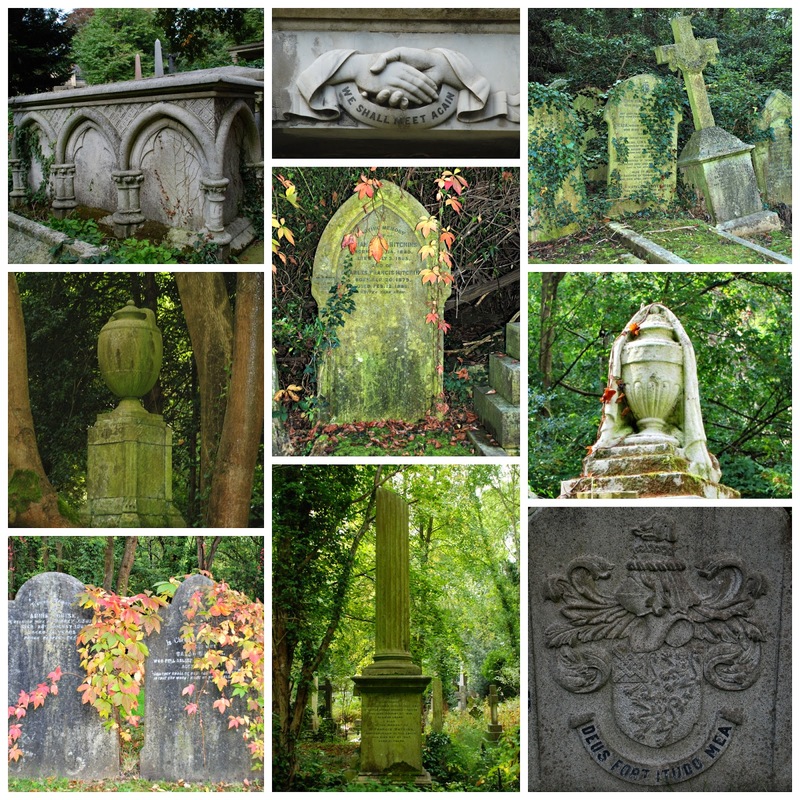 The Victorians loved the Grand Tour and were in thrall to classical culture, so many chose to demonstrate their learning and refinement by borrowing symbols from antiquity for their graves. 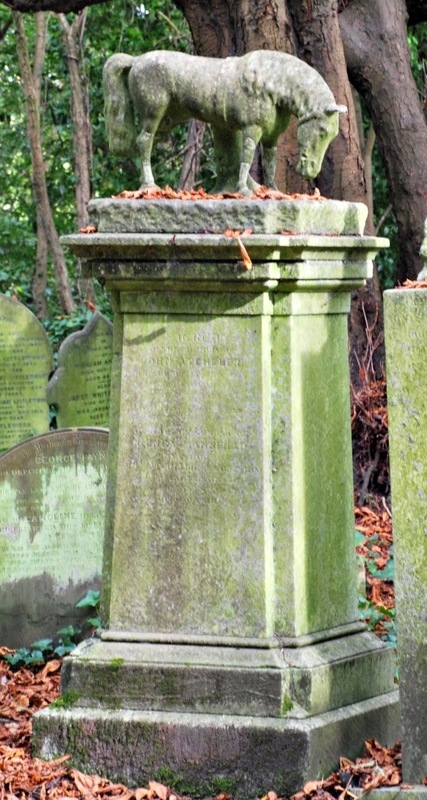 There are any number of classical funerary urns, broken columns and obelisks. Over in the West Cemetery someone has gone the whole hog and built themselves a pyramid; admittedly it's not a very big pyramid and, sadly for them, it's set back just a little too far from the main path for it to be unmissable. 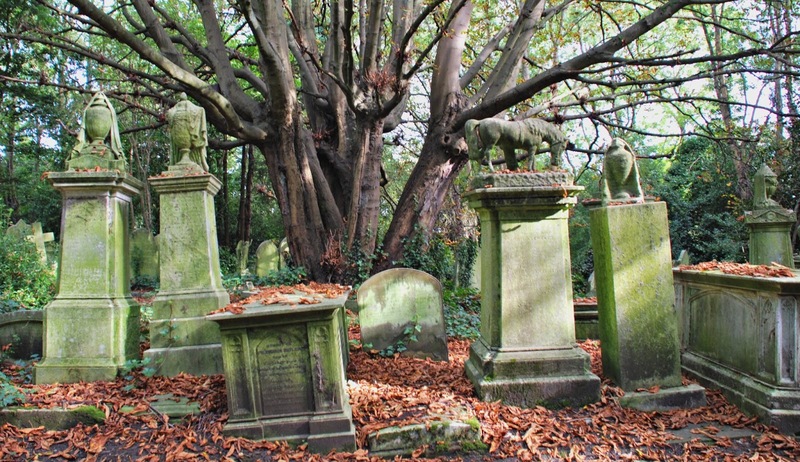 In the West Cemetery the Victorian love affair with the world of classical antiquity reaches its climax in the Egyptian Avenue and the Circle of Lebanon. These two features are truly spectacular in a very other-worldly, this-can't-possibly-be-London sort of way. Lining either side of the Egyptian Avenue, like terraced houses, are a series of private vaults, where whole families were laid to rest. Some still display their street addresses in life: one announced proudly that it was the final abode of one Jeremiah Dummet of Bayswater House, 34 Porchester Terrace. It's a sombre place, with each vault pretty much the same as its neighbours. 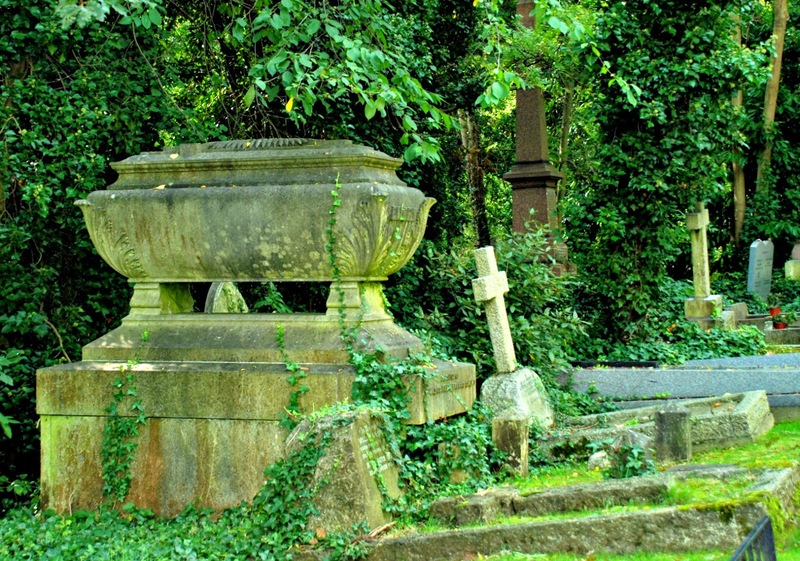 This sameness made it a slightly less attractive option for the Victorians who relished making their final resting place as unique and individual as possible. This part of the cemetery feels like a remnant of some long-forgotten civilisation. It's got a touch of Karnak or Pompeii or Angkor Wat about it: like it belongs in a different place and to another time. Each door of the Avenue is adorned with two up-turned torches of life, symbolic of the lives that have ended. The Avenue leads on to the Circle of Lebanon, which also has the air of an abandoned city, forgotten by time and misplaced in North London. In my mind's eye I could see the very grand Victorian funeral cortèges of long ago driving up to the outer gate of the Egyptian Avenue, where the coffins would be unloaded and borne by pall-bearers the last few yards to their final resting places in this amazing necropolis. The magnificent Cedar of Lebanon in the centre is thought to have been there for more than 100 years before it became the focal point around which the circle was constructed. Not surprisingly, given that the Victorians were responsible for the Gothic Revival, there's quite a lot of Gothic funeral architecture on display. 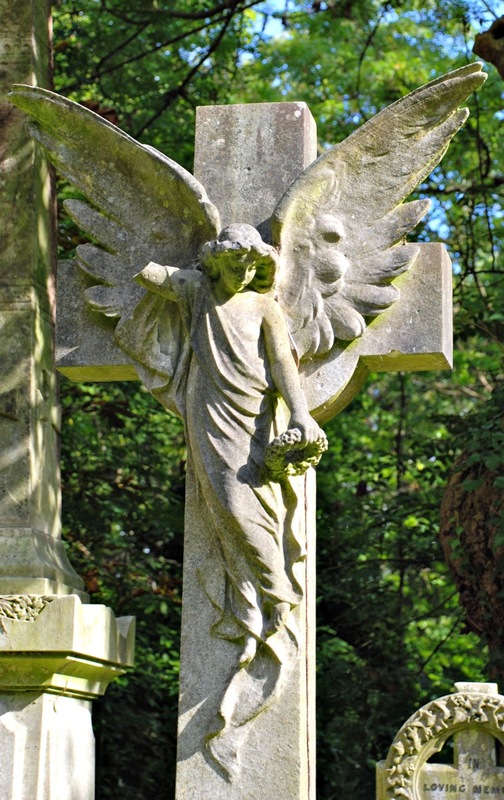 The most impressive of all is perhaps this amazing monument on the Mears family plot over in the West Cemetery. The Mears family owned the Whitechapel Foundry from 1781 until 1865. The foundry had been established way back in 1570, and still survives to this day, making it Britain's oldest manufacturing company. It was there that the Liberty Bell of Philadelphia and the hour bell of Big Ben were cast. 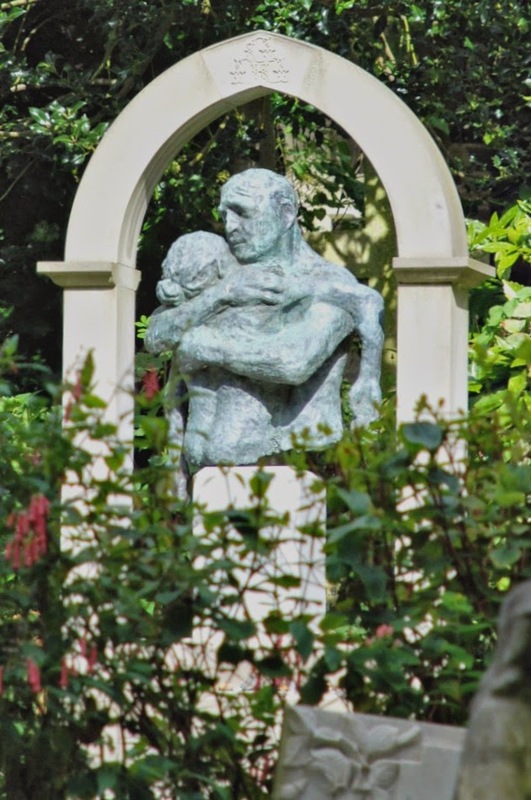 Within the cemetery there is little uniformity, but there is a common symbolic language used in the architecture to express the feelings of loss and bereavement of those left behind. Take a look at this beautiful, grieving widow. She's laden with symbolism. She is carrying an inverted torch, symbolic of the life that has been extinguished. 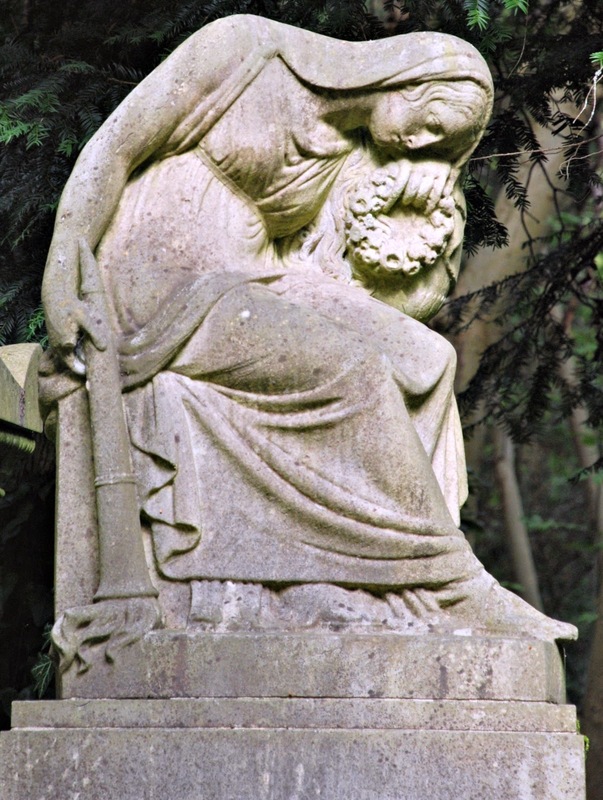 She holds a funeral wreath, a symbol of the circle of life, and she leans against a wreathed urn, which symbolises the soul of the deceased with the draped material marking the divide between life and death. With all these different accoutrements she is a classical image of grief and mourning. 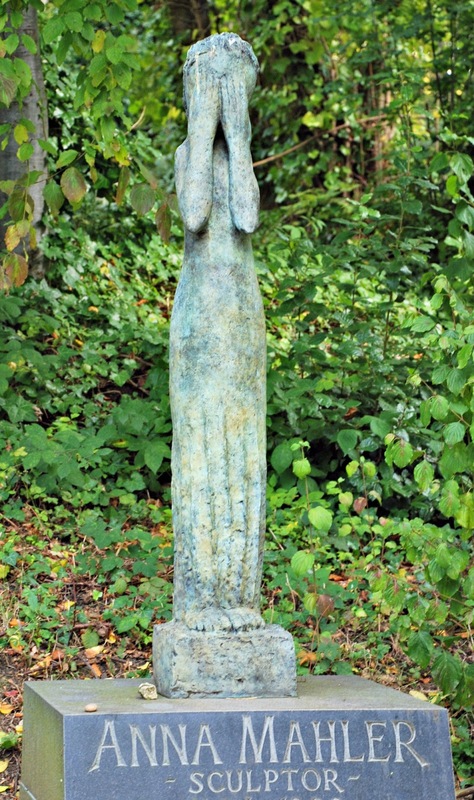 Some of the graves have been inspired by matters closer to home, and bear representations of what the deceased did in life. 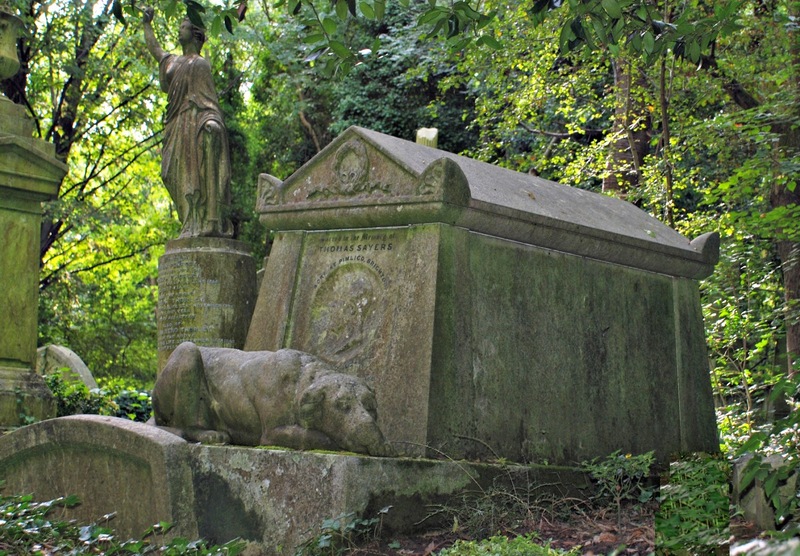 The man buried in the grave, shown below, with its plinth and rather sad-looking horse, owned a knacker's yard where horses were put down when they were no longer able to work. The knacker's grave sits in a corner of the cemetery where they seem to have been very taken with plinths and urns. They all looked rather splendid amidst the autumn leaves. 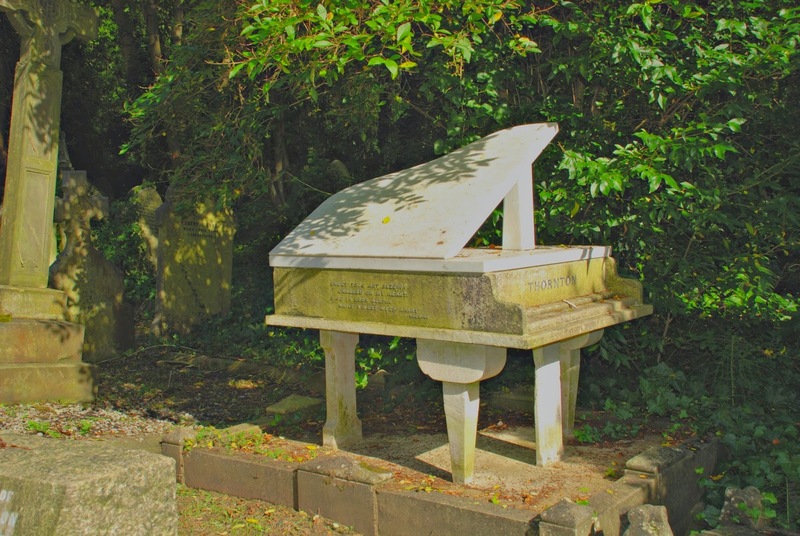 In a similar vein the concert pianist, Harry Thornton, who died in the Spanish Flu pandemic of 1918, has a tombstone over in the East Cemetery that represents his occupation very nicely. And then there's the grave of a famous bare-knuckle boxer called Thomas Sayers. Sayers had been a hugely successful prize fighter. By the 1850s he was the undisputed English champion. The sport of bare-knuckle boxing was illegal, but, driven underground by the authorities, it remained enormously popular with substantial amounts of money being bet on the outcome of each bout. Sayers' most celebrated encounter took place on 17th April, 1860 when he took on the American champion John C. Heenan in what many regard as boxing's first world championship. Sayers went into the fight as the underdog. The other man was eight years his junior, 40 pounds heavier and 5 inches taller. Early on in the competition Sayers lost the use of one arm through injury, but he carried on regardless. Heenan was dealt a nasty blow to the face, which blinded him in one eye for the duration of the fight. Undaunted by their injuries, the one-armed man and his half-blind rival slugged it out for 42 rounds before the contest descended into chaos. The crowd waded in, fighting amongst themselves and the police had to stop Heenan from strangling Sayers with the rope that encircled the ring. The fight was declared a draw in the end. Sayers never fought again, and he died five years later. He was an enormously popular figure, and 100,000 people attended his funeral. Given that he had fallen out with his wife, his beloved bull mastiff, Lion, played the role of chief mourner, riding alone in an open carriage directly behind the hearse. A beautiful statue of Lion guards his tomb to this day. 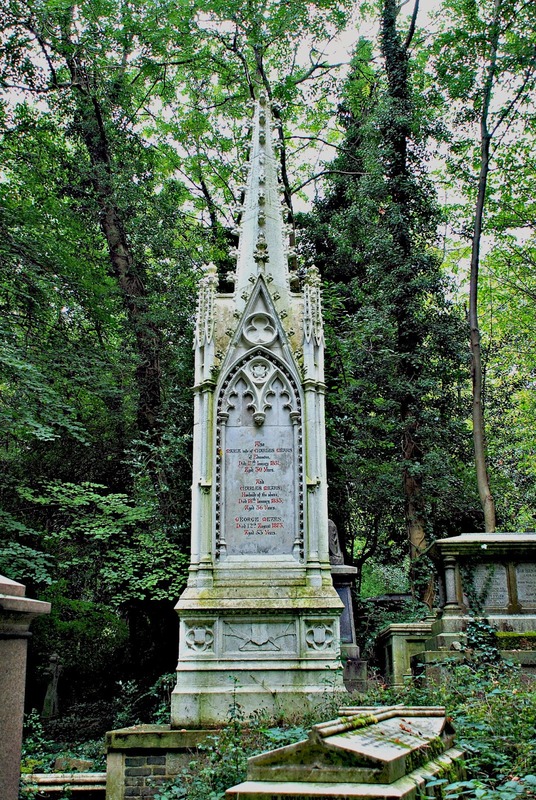 And then there's the grave of the menagerist, George Wombwell, who must go down in history as one of England's great eccentrics. Wombwell started out as a cobbler in Soho, but one day, acting on a strange impulse, he bought a pair of boa constrictors down at the docks from some sailor, newly arrived from South America. By this stage strange and exotic animals were being brought into the country from all corners of the globe, and the public were curious to see them. Wombwell started showing people his snakes and charging them for the privilege. Business went well, and he added some other creatures to his collection. By 1810 he had given up shoe-making and founded Wombwell's Travelling Menagerie, which quickly grew to become a successful business. By 1839 he was touring the country with 15 wagons packed with exotic animals, and accompanied by a full brass band. Many of his animals suffered in the comparative cold and damp of the English climate and, when they died, the indomitable Wombwell sold their bodies to taxidermists and natural scientists, who were keen to dissect their cadavers. On one occasion when he was attending the annual Bartholomew Fair in London his prize elephant died. His rival, who was also there with a menagerie, seized the initiative and put up a sign informing the public that his display had the only live elephant at the fair. Not to be outdone, the resourceful Wombwell quickly produced a sign announcing that his menagerie was exhibiting the only dead elephant at the fair. The ghoulish Victorian public were much more taken with the idea of poking a dead elephant than feeding a living one, so Wombwell did a roaring trade whilst his rival languished with scarcely a soul coming his way. 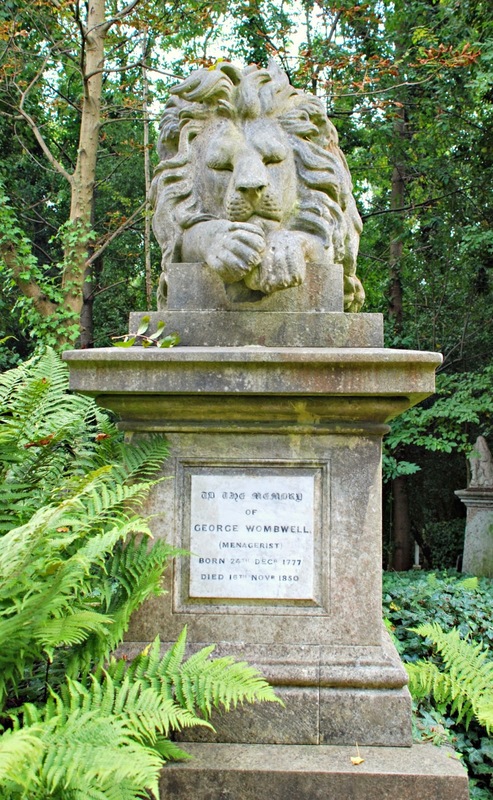 Wombwell was the first person in England to breed a lion in captivity; he called it William after William Wallace. The lion on his tomb, incidentally, is not William, but another chap called Nero, who was a bit of a star for being so docile that they were able to offer children rides on his back - for a fee, of course. One day Prince Albert asked Wombwell for his advice. The prince's dogs kept dying for no apparent reason. Wombwell discovered that their water supply was being poisoned. A grateful prince asked Wombwell what he could do for him in return. As it happened Wombwell had his eye on some of the timber that had been salvaged from the Royal George. Once the largest ship of the line, the Royal George sank whilst anchored off Portsmouth for some routine maintenance. Over 800 lives were lost making it one of the worst maritime disasters ever to take place in English coastal waters. The prince saw to it that Wombwell was given some planks, from which he had a coffin made. His coffin was then rather sensationally included as an exhibit with his menagerie for a number of years before he needed to use it. And it is in this coffin, made from the timbers of the famous warship, that he rests in his grave today. George Eliot's grave in the East Cemetery is, on the other hand, marked by a rather understated (by the standards of the day) obelisk. 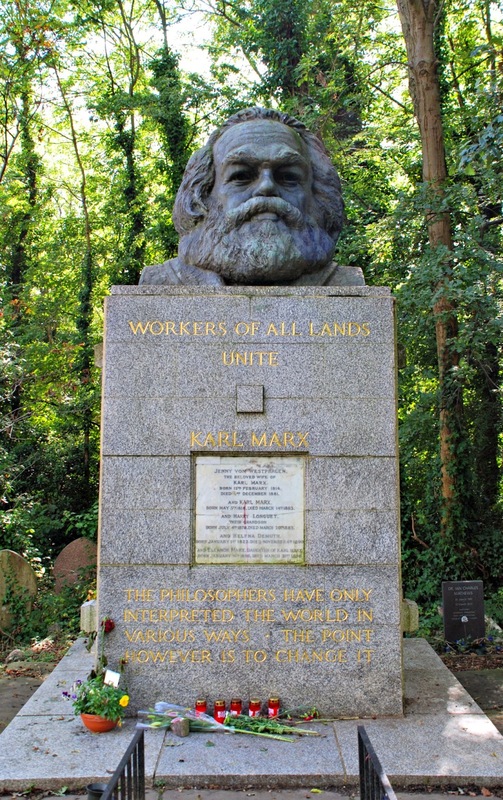 She's not very far away from Karl Marx. His funeral, on 17th March,1883, was a small affair attended by only eleven people, one of whom was has friend Frederich Engels. He was laid to rest in his wife's grave, which was in an unobtrusive spot on a small side path. However, in 1954, the Communist Party launched a memorial fund for him, raised a ship-load of money and had both bodies exhumed and reburied in an altogether grander and more prominent tomb beside the main path. I’m not sure that Marx, the great communist, would have approved of all his new-found grandeur; I’ve got a feeling that his first, modest plot may have been more to his taste. That corner of the cemetery holds a number of other notable Communists. Yusuf Dadoo, the South African communist and anti-apartheid activist, Claudia Jones, the Mother of the Notting Hill Carnival and Mansoor Hekmat, the Iranian Marxist theorist are all close neighbours of Marx. 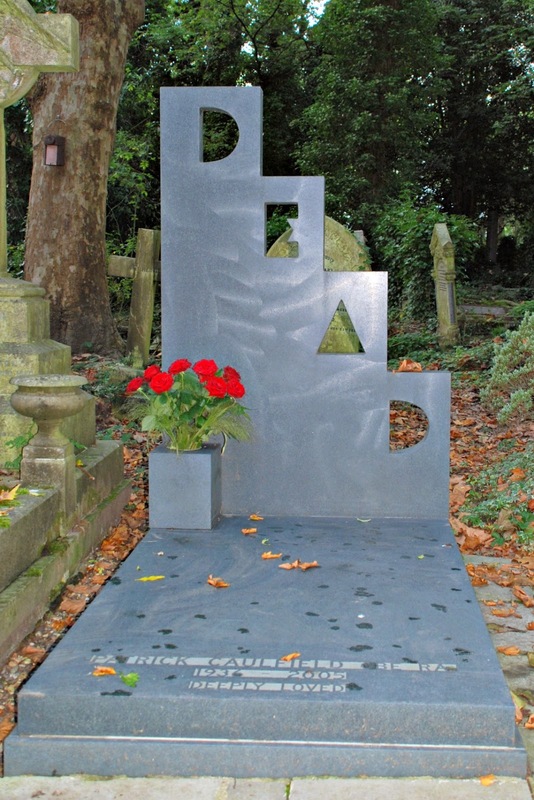 I was taken with the gravestone of the artist, Patrick Caulfield. Caulfield designed it himself, clearly intending for it to stand in stark contrast to all the sentimental ostentation of his Victorian neighbours. And then there's the headstone of Douglas Adams, author of the Hitchhiker's Guide to the Galaxy, a triology in five parts. 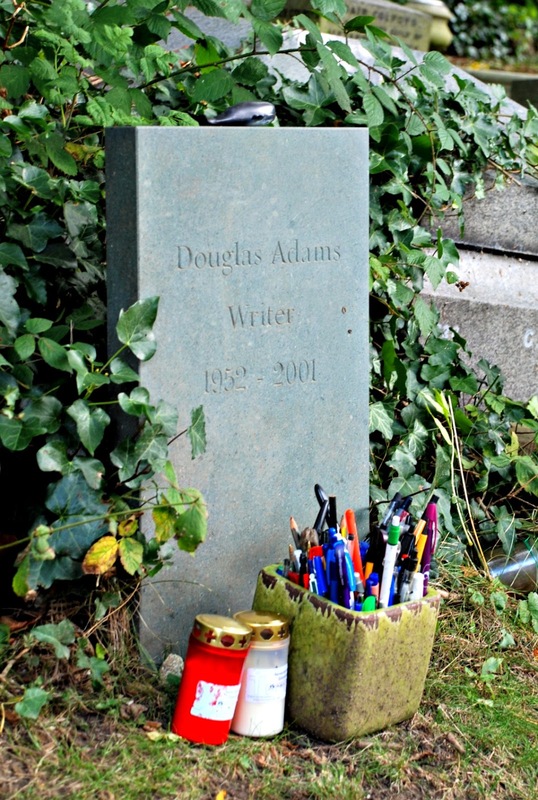 People in the cemetery were asking whether the pens and pencils were meant to be there ... . I understand that fans come to his grave and pay their respects by leaving pens in the pot in front. 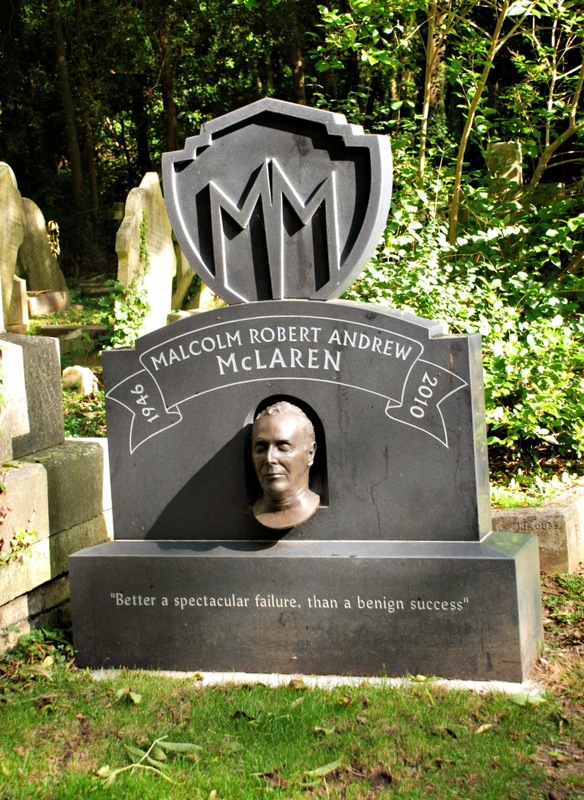 Malcolm McLaren's headstone feels very modern. I wonder if that’s the way he used to doodle his initials on the back of his exercise books at school. I'm not sure that I go along with his epitaph: Better a spectacular failure, than a benign success, but it certainly made a statement. One of the most beautiful headstones has to be that of Philip Gould, the labour peer. I was also impressed by the exquisite headstone of the Austrian sculptor Anna Mahler, daughter of the composer, Gustav Mahler. It's a copy of one of her works. This wonderful place fell into neglect during the middle years of the last century. 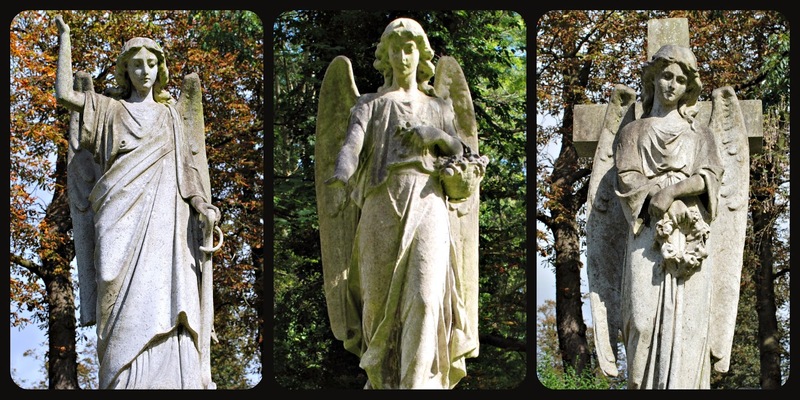 The appetite for ostentatious memorials died in the wake of the First World War. It seemed self-indulgent to make such a song and dance about a single death after people had witnessed mass slaughter on an industrial scale. Cemeteries and funeral architecture became more uniform and subdued, influenced no doubt by the war cemeteries. 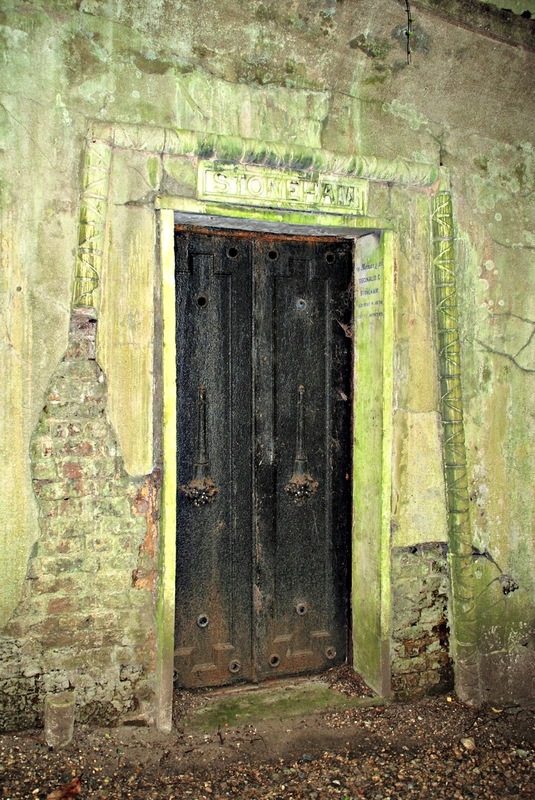 As a result Highgate was largely abandoned. 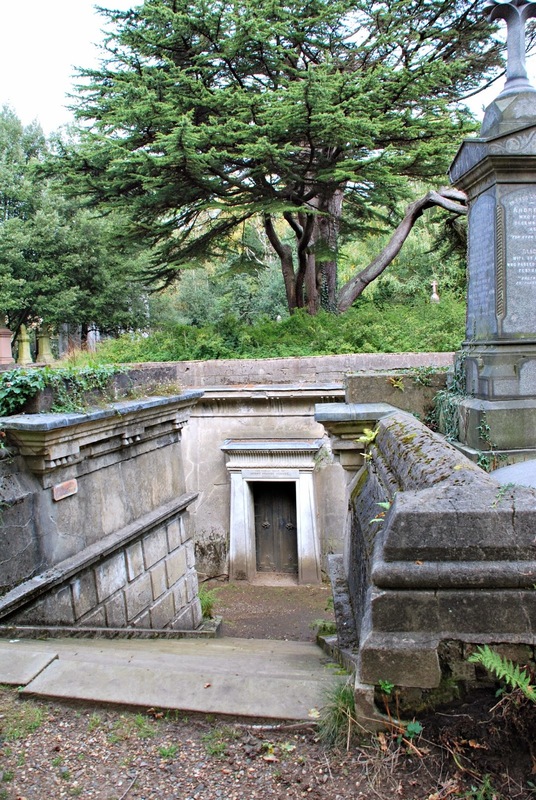 Vandals broke in and colonised the tombs. The undergrowth grew out of control, and the place came pretty close to being lost forever. 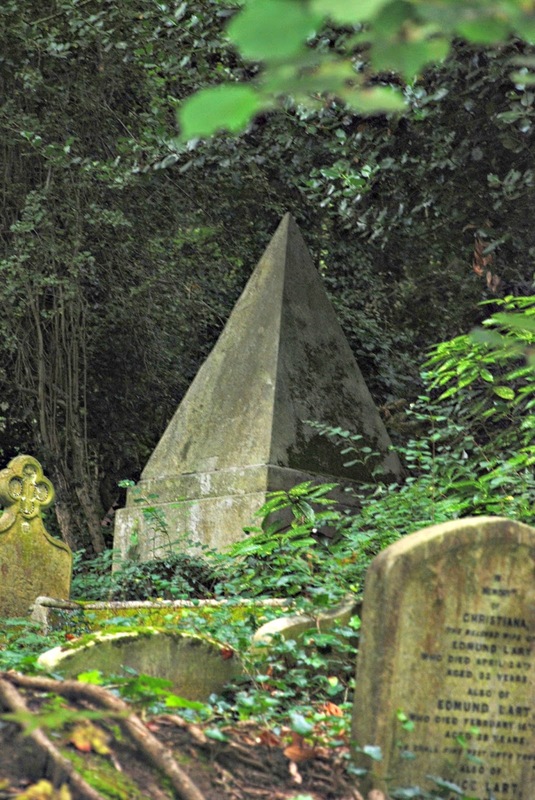 The Friends of Highgate Cemetery, a group of volunteers united by their love of the old cemetery were formed in 1975. Since then they have run the cemetery and have managed to turn things around with an extensive programme of repair and restoration. In my view they're a bunch of heroes who have saved a unique and wonderful part of our heritage. They are not government funded, and instead rely heavily on the money raised through their paying visitors. So please, if you've enjoyed reading about the place do go along, have a look round for yourself and give them your support. 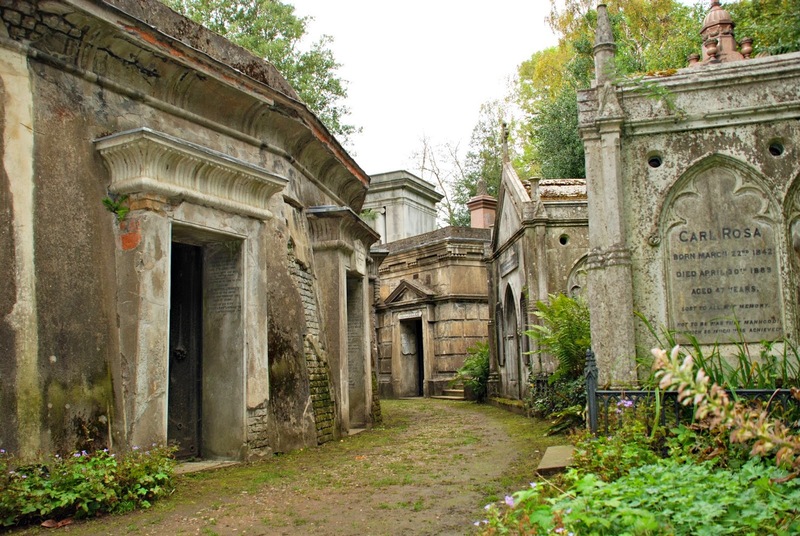 That is one of the most interesting cemeteries I have ever heard about. What a fascinating post. 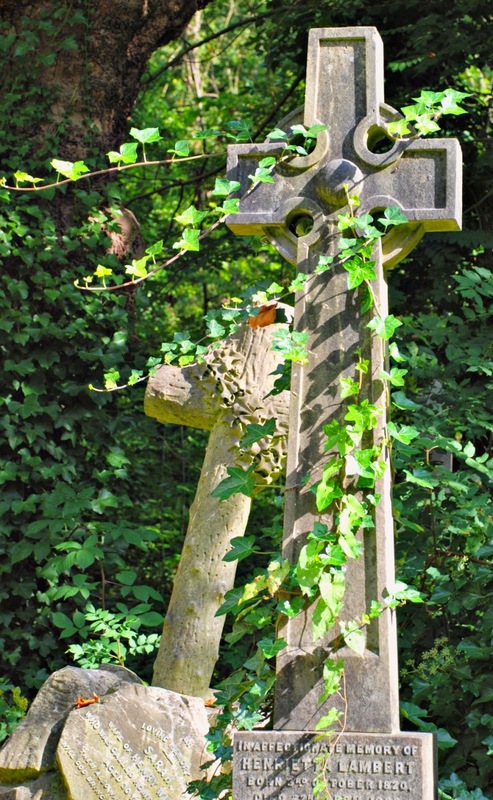 Wow - such beautiful shots of this amazing cemetery! 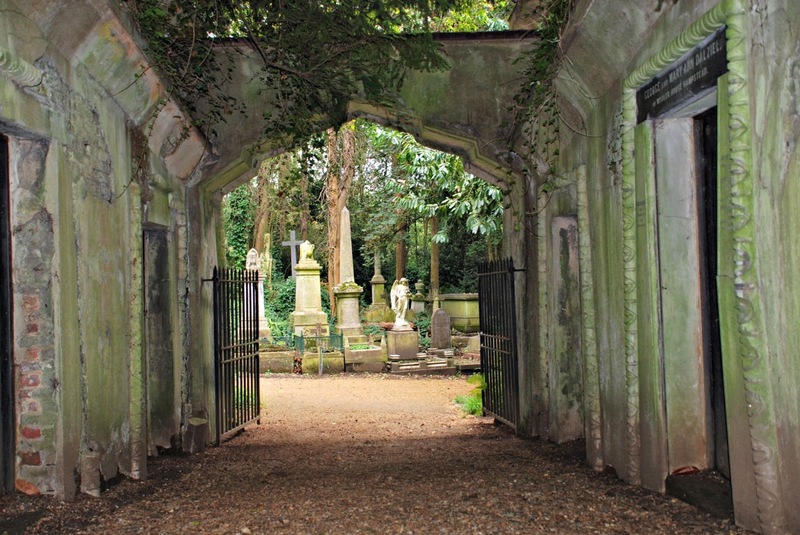 I visited Highgate for the first time earlier this year. I had missed the guided tours so will have to return. I found it to be a wonderful place with the rambling foliage over those immense memorials and gravestones. Thank you for the photos and giving me a new resolve to return. Thank you for this interesting tour through this old cemetery ! Some of the graves look really very imposing ! A fascinating article.Great pictures too. Well, just: wow. Great location, great pictures. What a fascinating cemetery. You were able to capture many great images. Thanks so much for sharing. 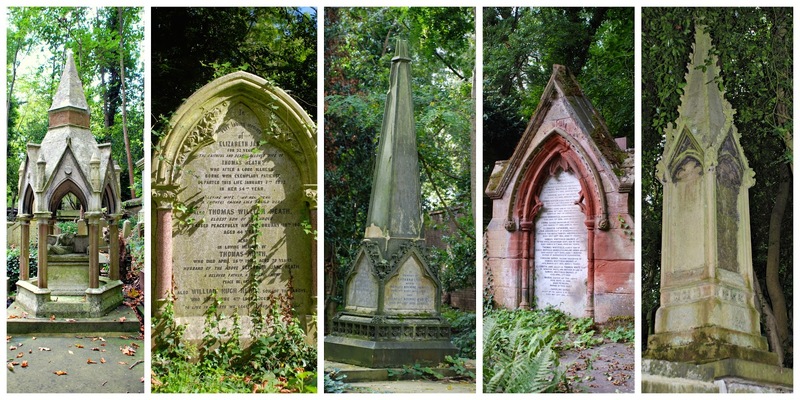 I've always been intrigued by cemeteries, their beauty and history. This one is amazing! Living in central Arkansas (USA) I have to admit, I've never seen anything like this! Wonderful tour, thank you! I love cemeteries Bonny and this is one of the best. I would love to wander the paths and photograph to my heart's content. Maybe someday...thank you for all the interesting back ground information. 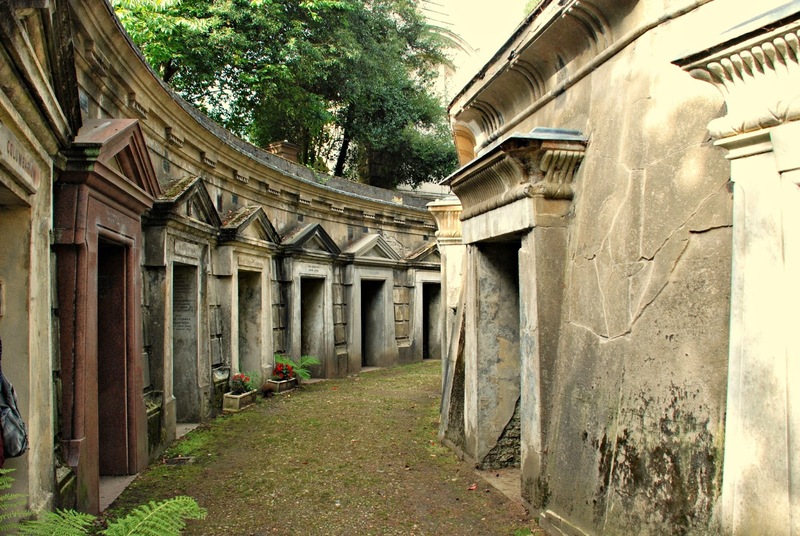 I like cemeteries, but I have never seen one like this. 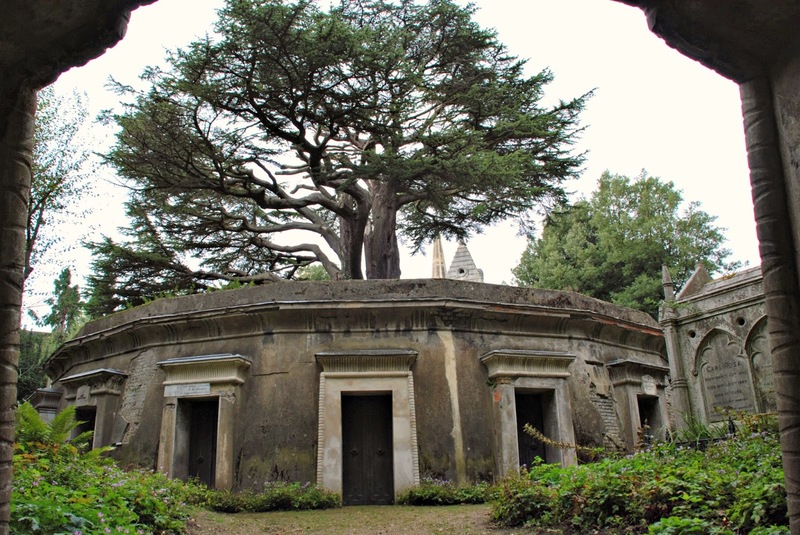 The Egyptian Avenue and the Circle of Lebanon are very interesting. Not necessarily beautiful though, and so different from the cemeteries I visited all over England. I love stopping by as i never know where I will visit. I am never disappointed. Thank you so much for the wonderful tour. I doubt I will ever get the chance to go myself so I absolutely loved this tour! Really, it is an awesome screenshot. I have never seen this much kind of various headstone. Thanks for sharing this post.